But most people do not know that the color representation on your display is more (at least equally) important. Whether the color is natural, whether the color is vivid, are easily identified by human eyes. For example, most people feel colors in Galaxy S, S2 or S3 are vivid, but not so natural; while on iPhone 4 or 5, it is natural, but not so vivid. 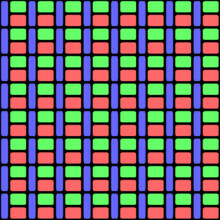 Different from the number of pixels, color is strongly affected by the technology used to produce the LCD panel. Basically, there are three different technologies for current LCD panels. TN-matrices is the old technology. The panel is usually used in cheap models, for example, Acer’s Iconia B1 tablet. The main problems of such panels include: slow response, small viewing angles and low-quality color reproduction. IPS panel (In-Plane Switching technology), or Super IPS directly addresses the problems in TN-matrices panels. It has quick response, best viewing angle (close to 180 degree), and good color re-production. Most high-end mobile phones, for example, iPhone, HTC One X, Nexus 4, use such panels. The major disadvantage is more power consumption. AMOLED (Active-Matrix Organic Light-Emitting Diode) is a quite different technology. Although the color is usually over-saturated in professionals’ eyes, for most people, the color is most vivid. This technology is dominated by two Korean companies: Samsung and LG. The later is the largest IPS panel manufacturer and does not make AMLOED panels for smartphones. SO, most AMOLED panels on your smartphones are manufactured by Samsung. Also, most middle to high end Samsung smartphones use this type of panels For tablet, only Samsung tablet 7.7 used this type display. For larger display on tablet, IPS (or Samsung’s PLS) panels are better balanced on cost and performance. So, it is clear Samsung will always try to defend its AMOLED panel on smartphone market. It also differentiates its high-end smartphones from competitors. If Galaxy S4 ditches AMOLED, it would be disastrous for Samsung display business. Samsung already demoed the 4.99 inch full HD SuperAMOLED panel, therefore, there should be no manufacturing problems. In addition, as an Asian company, Samsung will choose own components unless they have no choices. The rumored SoLux display actually is usually an IPS panel with patented SoLux lighting source. It is said such lighting source can re-produce natural daylight (therefore, better color re-production) and is even more efficient than LED. HTC’s Butterfly and HTC One use this type of display. But to be frankly, most people will not be able to differ such panels with any high-end IPS panels. For ordinary people, not for professionals, AMOLED panels still produce most “colorful” experience. What panel will be sued in Galaxy S4? My two cents are on SuperAMOLED. What’s your opinion? Please share with us in the comments section below. You can’t list AMOLED as an LCD….. as it is not an LCD. what is your definition of LCD? Anyway, I hope you’re right about the S4 using a 1080 AMOLED…. as otherwise, I won’t be excited about phones any more….. I’d probably get something other than a Galaxy out of spite for Samsung for not using an AMOLED. Thank you for your input. Actually the major difference between LCD and LED is how the LCD panel is lighted. In LCD, fluorescent lights (behind the screen) are usually used; while in LED, light emitting diodes are used. Some people still treat LED as LCD. The display in HTC One (HTC Butterfly) is actually IPS panel with SoLux. Smasung’s SuperAMOLED series provide bets user experience for normal users, although the color is over-saturated and not so natural. I disagree – My two cents are on the SoLux display. You compared the technologies, then made a prediction based on what you think is Samsung’s most predictable option… but you disregarded the manufacturing problems that they’ve been having while trying to make a full HD AMOLED screen at 4.99″. Did you miss that bit of news? There is also the dark pic that was supposedly leaked, which I’m sure you’ve seen. It clearly is not an AMOLED display, as the faded blacks indicate. The pic could be a fake, but there seems to be more evidence pointing towards Samsung ditching the AMOLED than the contrary. Let us hope so…. Thank you for sharing opinion. Yes, there have been some reports on manufacturing difficulties for the full HD OLED in this form factor since last year. But these can also be just some smoke released by Samsung to confuse competitors. Samsung has no choice but to release a full HD S4; otherwise, it will totally lose the momentum to compete other Android handset makers. As an Asian company, Samsung will try hard to use own components unless there are no other choices. So, even,if the quality of the display is not so excellent, or the defect rate is high (therefore higher cost), due to manufacturing, Samsung will still use own panel. Asian company usually cares too much about “face”, rather than profit. So far, Samsung only use Qualcomm’s chips in some high-end models for north American market. This is due to some unsolved LTE problems within own Exynos chips. Of course, if Samsung lacks the capability of mass production of such panels, they will very likely go with their own PLS (actually it is also IPS) panel. They can then license SoLux technologies. Anyway, now we are just speculating. In less than two weeks, we will know what is in Samsung’s hat.